Extremely popular in the southern U.S. as groundcover plants, these are now becoming known elsewhere, and valued for their versatility. Plants form a low clump of grass-like foliage, bearing spikes of tiny lily flowers in summer. This selection has dark-green leaves and deep-blue flower spikes. Evergreen. 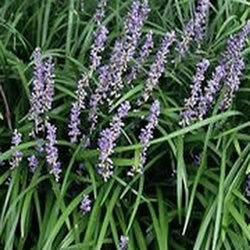 If plants look shabby in spring, trim the leaf tips with sharp scissors, or just mow back hard. Easily divided in spring. Where hardy, this is an excellent choice for edging, in rock gardens, or in mixed containers. Very tolerant of summer heat and humidity.